LEWISTON – In an email leaked to Maine Examiner by a campaign insider concerned about the direction of the campaign, Ben Chin mocks residents of Pondridge Road as “rich people” who complain about property taxes. A response from a member of his inner campaign team doubles down on the sentiment, eliciting an approving email response from Chin. 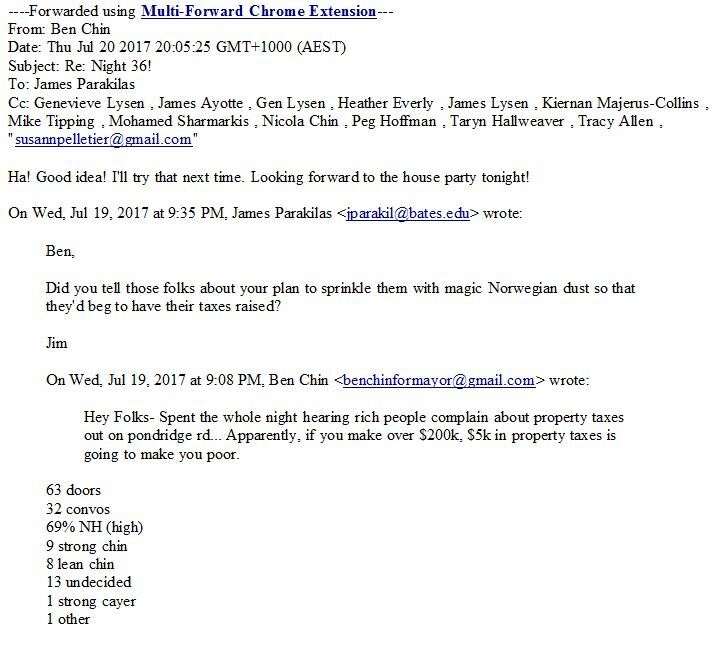 The email, sent by Chin on July 19, 2017 and sent to his inner campaign team, says he “ Spent the whole night hearing rich people complain about property taxes out on pondridge rd” and then goes on to suggest that the residents of Pondridge Road make enough money to afford high property taxes. Ben Chin speaks during Lewiston Mayor debate. Chin’s website does cover the issue of property taxes, but does not make mention of using “magic Norwegian dust” as a plan to get people to stop complaining about property taxes. In his official policy positions, however, Chin does take several shots at people he perceives as “rich”, while suggesting narrowly targeted ways to lower property taxes on some residents. It appears that the Norwegian dust reference relates to the “Norwegian socialism” model which liberals often cite as a model for the United States to use in implementing socialism. Multiple sources report Norway’s property tax rate as ranging between .2% to .7% annually, versus Lewiston’s current property tax rate of more than 28 mills, which equals roughly 2.8%. These numbers indicate that Lewiston’s property tax rate dwarfs the Norwegian property tax rate. About one in four municipalities in Norway reportedly do not even assess a property tax. Apparently as a result of not wanting “rich” people such as those on Pondridge Road to get a property tax reduction, Chin does not propose using approximately $2 million in state funding to reduce property tax rates for all Lewiston property owners. 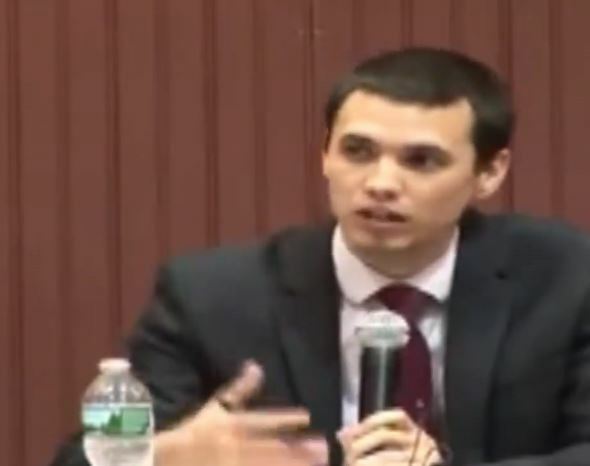 The Maine Examiner has published several internal campaign emails leaked by a campaign insider which provide insight into the Chin campaign and the candidate’s views on the issues and voters of Lewiston. All emails have been examined for authenticity. Stories appearing in Maine Examiner have been covered by the tv station WGME and the local newspaper Lewiston Sun Journal. Chin, the political director of the liberal political group the Maine People’s Alliance and an Augusta lobbyist, is seeking election as Mayor of Lewiston in the December 12 election. Chin’s opponent is Shane Bouchard, a Lewiston native, local small business owner and current member of the Lewiston City Council. A screenshot of the email is provided below.